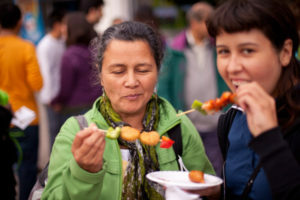 Join us, and over 40,000 visitors each fall at Harbourfront Centre in Toronto, to celebrate this year’s Veg Food Fest! Try Toronto’s best and unique veg products from over 160 vendors. Taste locally-made artisanal vegan cheeses, find your next cruelty-free soap, or learn more about how you can make a difference – there’s something for everyone at the Veg Food Fest! Stay tuned for our list of 2019 Vendors. Stay tuned for our list of 2019 Presenters. For media inquiries, please email festival@veg.ca.